Trevor and Logan got to go to this year's Cub Scout Day Camp out at the Sportsman's Club. It was a great week of all their favorite boy activities. They left every day at 3:00 and didn't get home until after 9PM. Let's just say that they were TIRED after a week of playing so hard. They both earned at least 7 awards and had so much fun doing it. There was boating, fishing, archery, map reading, flag raising, and countless other scout requirements for them to participate in. One of the Cub Scout Day Camp traditions states that the boys will wear the same shirt to camp every day. They should also NOT WASH the shirt until after camp is over. (It's some manly man type of challenge - you know, to see who can be the most stanktified - actual term - by the end of the week = the true scouter.) They were some stinky stinky boys - that's for sure! The family was invited out on the last day to watch some final activities and eat dinner with their boys. It was so fun to see hundreds and hundreds of boys all the same age just enjoying themselves to pieces. Here is Trevor, pulling Jake in the wagon, getting ready for their first Monkey Island relay race. These boys watched all the groups go before them and had their strategy down before the race began. And guess what?! They won EVERY RACE! They were the two smart cookies out there. Logan also had a great time with this challenge. His idea of fun was not to win the race, but to see just how wet they could get. Garon was his partner and they definitely got soaked. Check out the water drips coming off Logan's face! This rocket activity was one of the most anticipated of the week. 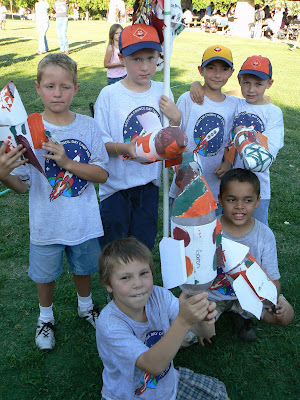 They built and decorated their rockets earlier in the week with the plan to blast them off on this final night. Here's Logan's group all together waiting for their turn at the launcher. Trevor was all serious business when it came for his turn to launch. Check out his concentration. Here are all the rockets waiting to launch at the same time. And can you guess the 2 ingredients used to propel them into the sky? Water and air pressure. That's it. This video is very washed out, but you can see the power of the launch. It got a great response from the crowd every time. It was a great week. Special thanks to all the leaders that gave so much time to make it such a great experience for our boys! They loved every minute! What fun! How did you make it through dinner on that last day with all the boys so "stankified"? Guess who stopped by last night? ?